HONG KONG—Hong Kong’s decision to refuse to license the popular Hong Kong Television Network has sparked mass outrage among residents, with talk of political motives, declining press freedom, and a legal challenge. HKTV chairman Ricky Wong Wai-kay questioned the fairness of the Commerce and Economic Development Bureau’s decision that came down on Oct. 15. Two other stations, i-Cable and PCCW’s Now TV, were granted licenses. He said he received a call from the government in December 2009 inviting him to apply for a license. For three years Wong said HKTV had trusted the government and the system. In the past few years HKTV has invested over HK$900 million (US$116 million) in the operation, produced 200 hours of serials and 100 hours of variety shows and information programs, and purchased 800 hours of outsourced programs, Wong said. When talking about the need to lay off 320 staff members, Wong was close to tears. At an Oct. 22 press conference, Wong said HKTV would seek legal redress.. According to various observers, HKTV has the elements for a good case. Former Executive Council member and Liberal Party chairwoman Selina Chow Liang Shuk-yee said that since 2009 the government had raised “reasonable” expectations that HKTV would get a license when granting land for the station’s multimedia center, according to the Standard. The government had also repeatedly stated there was no limit to the free-to-air TV licenses, according to Chow. In his press conference, Wong also stated he had been told there would be no limit on such licenses. Eric Cheung Tat-ming, principal law lecturer at the University of Hong Kong, told the South China Morning Post (SCMP) that if HKTV could show the government had made a “sudden change” in policy and had set aside its original policy objective of introducing competition, then a court might set aside the government’s decision. Associate professor of law Benny Tai Yiu-ting, also of the University of Hong Kong, told SCMP legal action by HKTV had a chance of succeeding on three grounds: illegality, procedural impropriety and unreasonableness. According to media reports, HKTV was not ranked last among the three applicants in a consultant’s report commissioned by the Communications Authority. At the press conference, Wong had said regarding financial means, commitment, quality and level of production, HKTV was not less than the other two applicants. Within a few days, almost 500,000 netizens signed a Facebook page that supports a license for HKTV. Netizens called for a gathering at the government headquarters on Oct. 20 with all attendants dressed in black. According to organizers, 120,000 participated in a march that ended at Tamar. Immediately after the decision was announced the Democratic Party, the Neo Democrats, and the Labor Party all protested in succession outside the government building. 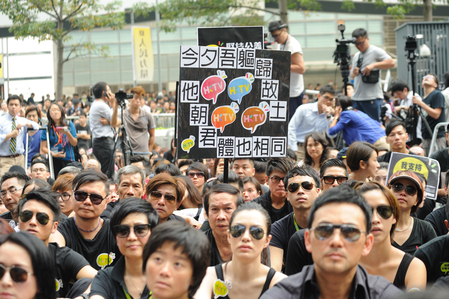 Members of the public and laid-off HKTV workers have protested every day outside the central government complex. At his Oct. 22 press conference, Ricky Wong urged the protesters to go home, saying the fight to overturn the government’s decision would be a long battle. The decision to deny the license to HKTV was made by Chief Executive Leung Chun-ying, according to the convener of the executive council, Lam Woon-kwong, as reported by the Standard. Netizens have accused Leung of coordinating with the Chinese Communist Party to suppress freedom of speech with the license denial to HKTV. Leung is widely believed in Hong Kong to be an underground CCP member. A comment made by Wong in 2008 is said to have rubbed the People’s Republic of China’s Liaison Office the wrong way. Wong worked 12 days as chief executive of aTV (Asia Television Limited), which was said to be Hong Kong’s CCTV. During a staff meeting Wong declared that aTV would not be another CCTV, saying “pro-communist TV has no market; only anti-communist TV draws an audience.” Wong’s resignation followed. In response to claims that politics were involved in denying HKTV’s license, Wong said at his Oct. 16 press conference that he did not understand politics. Ricky Wong has a reputation for being very daring and outspoken, which earned him the name of “the magic kid” of TV. The climate in Hong Kong under Leung Chun-ying has not favored outspoken media figures. One staff member of HKTV discussed on his personal website a factor that he said Wong dared not discuss. Ever since the CCP took over Hong Kong, the Hong Kong media has been increasingly self-disciplined, the staff member observed. A lot of media owners have business transactions in the mainland or for the convenience of entering the mainland markets apply self-discipline in news reporting. A Hong Kong Journalists Association’s 2012 survey on news operators showed that among those interviewed, 71 percent had applied self-discipline, while 35 percent admitted that either himself or his superior has applied self-discipline in the past year. The situation has deteriorated since Leung Chun-ying has been in charge. This past June Jimmy Lai, the chairman of Next Media Ltd, and in July, Shih Wing Ching, the founder of the newspaper am730, were both threatened by unknown assailants with violent attacks. This past summer, members of the Triad beat protesters who opposed Leung, and Leung never objected to their doing so. Early this year the British government submitted a semi-annual report on Hong Kong with concerns about the tightening press freedom since Leung Chun-ying became chief executive. This July, the Hong Kong Journalists Association published its 2013 annual report, titled “Dark Clouds on the Horizon: Hong Kong’s freedom of expression faces new threats,” which describes the past year as the worst year for freedom of press in Hong Kong.